In the year 2000, a group of ordinary people undertook an extraordinary journey to one of the most isolated parts of the world: Far West Tibet. From Lhasa in the east, they travelled west across the Tibetan plateau on the forgotten Tasam Highway. They stopped at old tasams or stage posts and were charmed by the stark beauty and local folklore of the country. Fighting exhaustion and High Altitude Sickness, the group completed the strenuous and demanding circumambulation, kora, around the sacred Mount Kailash. They come across a map of the region, indicating two different sources of the river Sutlej. That, the author was convinced, was a mystery she was destined to solve. They noted that in the land of practising Buddhism, legends about mountains, streams and lakes were intertwined with observations made by early surveyors and explorers. When they reached the remote lakes, Manasarovar and Rakas Tal, they found the Ganga chu, the stream traditionally known to join the two lakes, had disappeared for long distances. This fact further strengthened the resolve to find the present source of the river Sutlej. 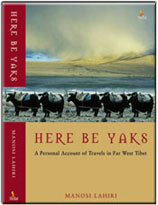 The author returned to Far West Tibet with her travel companions once more in the Year of the Horse, 2002. They found that Lhasa had changed visibly in two years and their sojourn there was marked by nervous tension as the group was split. But the journey to the Far West was more magical than the previous one. In a strange trick of nature, while standing on the ground, they saw the tops of the Himalayan peaks from above! Apprehensive and hallucinating, they walked the hidden inner kora path of Mount Kailash and kora of Lake Manasarovar following the footsteps of past sages and monks. Finally, when the group reached the Lost Guge Kingdom in the heart of a barren land, they were surprised to find an abandoned citadel carved out of a hill on the banks of the Sutlej. They were concerned that the river was being dammed at the Zada gorge and its possible impact downstream in India. But they were astonished and enchanted at the vibrancy of the fine art and rich colours of the chapels in Tsaparang and the Toling monastery. 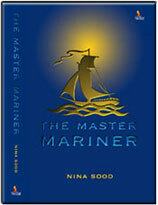 The unusual name of the book is derived from the idea of early navigation maps. In olden times, when there were vast expanses left unexplored, cartographers marked uncharted lands and seas with the words Here Be Dragons. This was a warning to travellers of potential dangers. 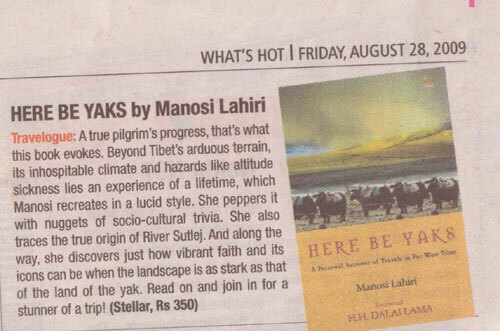 In a similar vein, Here Be Yaks, forewarns the reader of a journey to a land that is yet to be fully explored and is full of unexpected happenings. It is also the land of the yak. Sailors have a knack of 'spinning yarns' about their sea voyages that carry them across the global shores. On a dark night bereft of moonlight, the creaking and weird noises emitted by the ship's movements, combined with the sounds of the waves hitting the sides of the vessel, evoke scary memories of ship captains murdered at sea and ghostly apparitions. Life on a cargo merchant vessel is isolated and in a way secluded from the realities of daily life. All the same, there is something whimsical and ethereal about a ship, and you are transported into a terrain, which seems unreal and often personalities change, as the romantic atmosphere takes over encouraging one to leave inhibitions safely ashore. The central figure, Krishan Sood, joined the merchant navy at the tender age of fourteen as a lowly cadet during the early 1940s. It was a time when ships were manned by British officers who spoke with accents alien to him, as was the diet on the ships consisting of roast meat oozing with blood and boiled, bland vegetables. He cheerfully adjusted to the strange environment, worked his way up on the ships, and finally qualified to obtain the ticket of a Master Mariner, to command foreign-going merchant vessels all over the world. His wife, Nina, at a much later stage in life, accompanied him on many of his voyages. As she relates these assorted, engrossing marine experiences, recalling the delightful and unusual episodes of the temperamental seas, simultaneously she also ruminates over Krishan's fight and his losing battle to lung cancer.